The area were Link first meets Zelda as children. It's a nostalgic place as, before then the games were all about getting to Zelda (to rescue her) and in OoT you meet her early on. It kind of had a feeling of watching fate happen in front of your eyes. 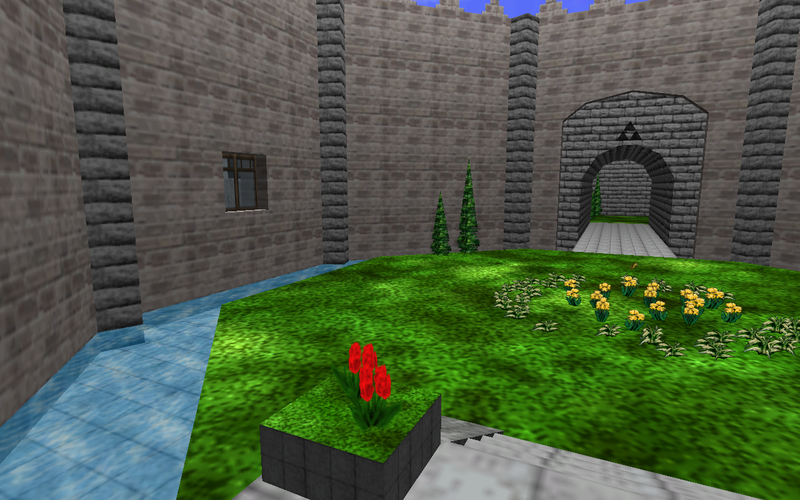 The area itself is of course, a grass courtyard surrounded by a small moat and the castle walls. 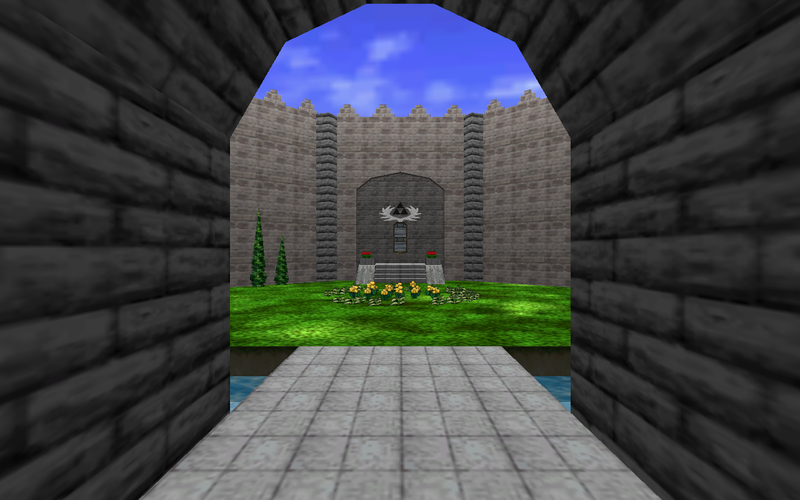 There's a few windows, one of which you first lay eyes on Ganondorf through in the real game. My VRChat version includes a reasonable attempt at surface appropriate footsteps, an array of bird chirping background sounds, the sound of running water, and of course the music. I added a butterfly, and changed the Skybox to that of Hyule Field. Dropped in a couple of my own easter eggs, and thats pretty much it. It was my first attempt at a custom VRChat room, and I wanted to make it a polished pleasant experience enough to hold an entire VRChat meeting in. I wanted it to be more than the default rooms we saw before, so I wanted what those were lacking. Sounds. I hear people say all the time that its the little things you don't pay attention to that sell a VR experience, like sounds, and feeling like the ground is having some sort of reaction to you waking over it, or that theres something beyond those walls (in this case birds) helps make you feel like your somewhere else. Or animated running water with sound makes it fell a little more real, even if its just 1996 blocky low res textures. Add onto that the spinning Skybox to help make it feel like the clouds are moving. Compared to the other 2 rooms I've shown so far, I tried to focus a little more of the details, kind of like a extension of the mentality I had when putting together the Kokiri Forest demo. I didn't exactly plan to show the room off today, it just happened. I was just going to show off a avatar I put together the night before. It was at least some what related to the room though. Sadly, it was about as big of a hit as the Child Shiek avatar was. 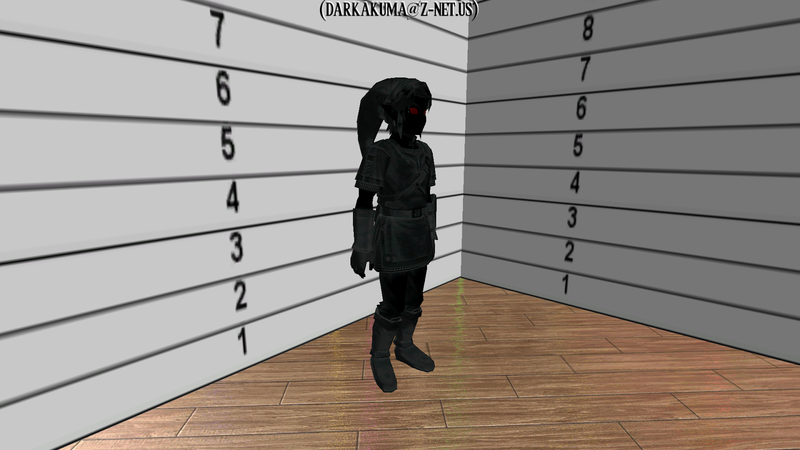 That avatar is Dark Link from Twilight Princess. I've had this model sitting on my HDD for a little while. 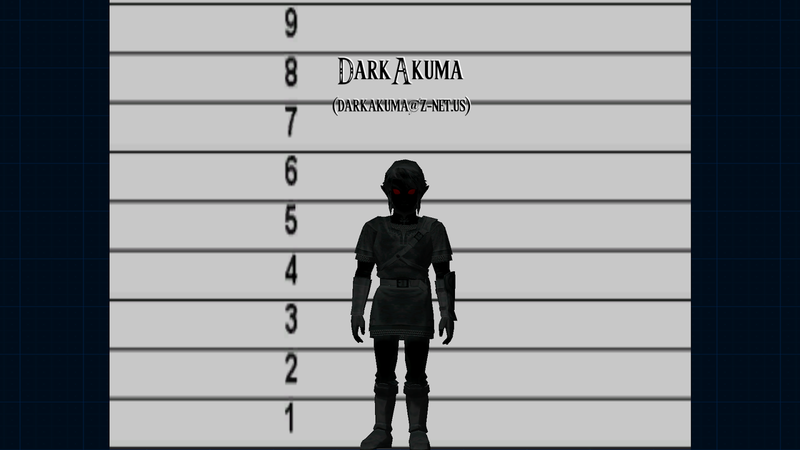 I was considering using it as my main avatar as it's "Dark", which goes with DarkAkuma, and it's a full sized Link which goes with my current Zelda project sort of, and isn't short. I threw it together last night initially as a test of the Mixamo Fuse program. Once rigged, I decided to go full force and have something else to show for my custom nameplate idea. So I made a nameplate using the Zelda font, added my email address, and went one step further and made the talking image animated. Some people certainly liked the room, a couple maybe acknowledged the avatar/nameplate, but overall the reaction wasn't quite what I was expecting I guess. It was not what I'm used to from previous weeks and such. I think thats a sign that I'm hitting the ceiling at what I can do in VRChat that's interesting. So I may dial it back on the custom stuff going forward, and not do new things every week. It can be a LOT of work for little fan-faire. Instead I should start putting more effort on things I show off every once in a while. 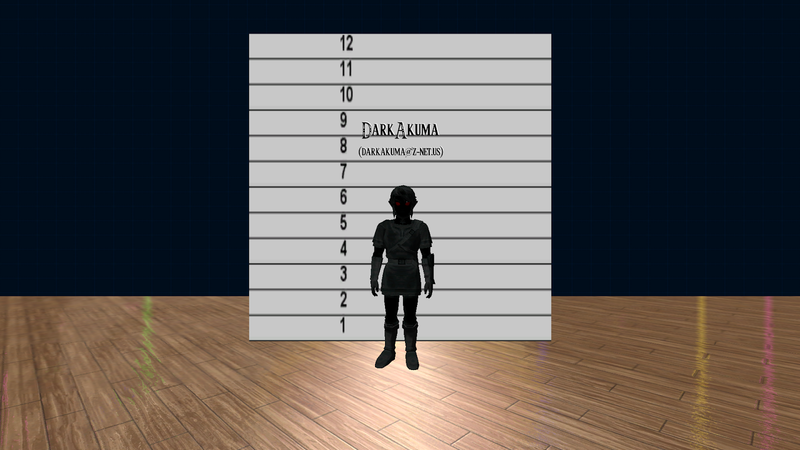 When people are ooo'ing and ah'ing over changing a simple scaling variable in a matter of minutes, versus of a room I spent days on, and a avatar I spent a few hours on, its time for me to change, or at least change my expectations. It was nice being the "What will he do this week?" guy while it lasted, but it wasn't going to last forever.